Having just joined the forum, I thought I'd add in a few posts on my restoration of S/V Lady Anne; particularly the swing keel repair. To begin...When I obtained her, un-named and gnarly, the swing keel brackets were rusted severely...looked OEM and exposed to saltwater long term (boat history indicated berth on Gulf Coast). I assumed that in that state, if launched, she'd take on water in no time. The first step was getting her off the trailer and onto the bunks we made to support her for the restoration. We did this using beefy timbers with multiple tie ins and fastening; assuming the entire 3k lbs would have to be evenly supported from some months. It took about a week to finish these themselves. We used high density plastic to "bed" the contours, which we cut using a template we made from the boat's own hull. Using a forklift, we raised her off the forward end of the trailer, and set the stern first, then pulled the trailer and placed the forward bunk. This all went surprisingly well. Dropping the keel itself too much more effort...we built a cradle, but had to go easy with the forklift to get it placed. 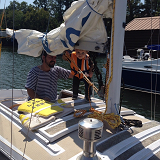 In the end, we were still about 2" short, and had to "kick" the keel out on an angle (leverage does amazing things). We couldn't get the pin out from the port side access, so I used a whole pack of SAWSALL blades to cut both sides free. A family friend and long-term machinist made the replacement brackets out of high-grade carbon steel, which we coated (reasoning that the former were CS and lasted at least a few decades). SS or bronze would've been nice, but $$$ and the ability to mill the material had a lot to do with our decision. So far, I've not regretted it. We found a correct diameter length of high grade SS for the new pin, and did several "dry fits" before bedding the brackets in with GE silicon. I've read lots of material on what / what not to use for bedding, but my take is that if you allow a few minutes for the silicon to cure, use plenty of it, and think of it as a gasket...not adhesive...you get the same effect. Five months wet, and I've no leaks. I opted to remove the "snubber"...didn't plan on ever going blue water and didn't want to break the housing if I ran aground in our shallow lakes. Used off-the-shelf pluming to replace the "snubber" housing. I used brass washers and SS bolts; logic being that the SS wouldn't corrode as fast (if kept dry) and the brass would "seal" a little better. This too was a calculated risk, but so far, it seems to have been a wise (and neat looking) solution. We faired the keel by using a lot of elbow grease, then filling with Marine glass, re-sanding, re-filling, sanding again, then painting. I used an industrial alkyd machinery and equipment enamel...so far, it doesn't appear to be blistering, fading or seeping. As an added bonus, I'm not breathing in copper dust. I decided to keep the keel cable that was one her as I saw no kinks, "fish-hooks", fraying or even that much corrosion before getting her wet. We'll see what it all looks likes this Spring when hopefully we pull her again for annual checks. Last edited by DizzyG78 on Wed Dec 20, 2017 11:08 am, edited 1 time in total. Congratulations! --- You have officially graduated from the school of "I dropped a Chrysler 900lb Swing Keel on my own, replaced all the hardware, and lived to tell about it"
Seriously, very nice indeed. I don't think any 2 owners here have used the same method. Some use garage jacks, some various wood contraptions,..if you go back and look at some of my posts from years ago I used some steel supports I welded myself. 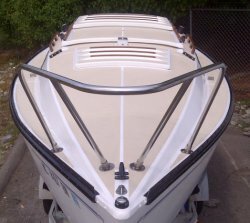 Main reason on my design was i needed to drop the keel onto the trailer and pull the entire thing out from under the boat. My keel was a disaster of rust. Took lots of grinding to cut out all the pitted spots,...then filled those with 2 part epoxy, faired, and coated with Epoxy Coal Tar. Seriously though-Couldn't have done it without the right equipment and support. 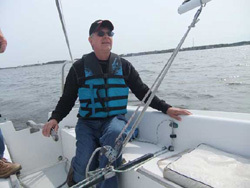 In my very humble opinion, the swing keel design is the first of two major design "flaws" in the Chrysler design (the second being the standing rigging) proving the boat was never intended to be sailing four decades on. The one big "mod" I did to the OEM design was to add in the inboard "washer plates"...this seems to have been an essential addition towards ensuring the nuts and washers had sufficient leveling and that the silicone sealant had something on both ends to "squish" with. The complexity and difficult of building the bunks was the biggest "unexpected" challenge...those things could hold up a Sherman tank LOL! You did a wonderful job on the swing keel project, Dizzy. Preparing to do mine gave me many sleepless nights...so glad when it was completed.